Through our mapping phase, we identified one-hundred spaza shops in Monwabisi Park. Breaking the shops down in to sections, there are 16 shops in A section, 32 in B, 40 in C, and 12 in M section. We attribute this primarily to the relative sizes and populations of each section; B and C sections are larger and more dense, where A and M sections are smaller and particularly M is more spaced out. There is an incredibly broad range of spaza shops in Monwabisi Park, and no two shops are the same. Based on the shops that we observed, we created several general categories to characterize that spaza shops as seen in the table below. Below is a map of all of Monwabisi Park that we created using Google Earth. Every red dot on the map represents a single spaza shop. This section explains our findings from the informal conversations, key informant interviews, and focus group discussion. 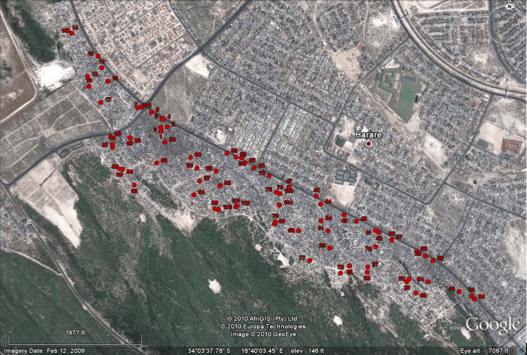 The data we gathered from spaza shops in this area was fairly consistent between all of the shops. For example, almost every shop owner told us that they had started their shop because they were unemployed and needed a form of income. We verified almost all spaza shops in Monwabisi are run out of the owners home. They obtained the start up money for their shops from a variety of sources. Some borrowed money from friends or family, some people drew from other sources of money such as child support, and some sold valuable items to generate the cash. One woman sold her car in order to attain the start-up capital needed to get the initial stock, shelving, and other necessities to run her shop. We also gathered data on how long spaza shops had been in business, because it serves as an indicator for the stability of the spaza market in Monwabisi Park. If the shops tend to be older, that indicates the market is more stable; if many shops are new, then that would indicate the market is less stable and changes frequently. 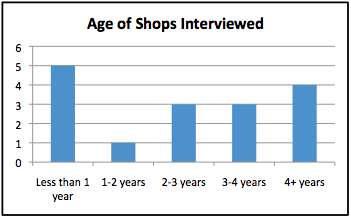 We found that the average age of spaza shops, among the shops we asked, was 4.9 years. The oldest shop was ten years old, and the youngest was two months. This seems to indicate that the spaza market in Monwabisi Park is relatively stable, which indicates business training would be beneficial to the community. To the right is a graph of the ages of all the spaza shops in Monwabisi Park. 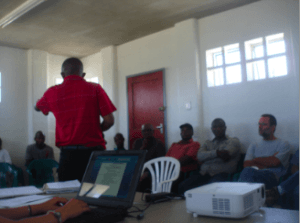 We gathered information about the future plans of spaza shop owners. If a shop owner is willing to give up his or her shop for a more reliable and stable way of earning income, then they are likely not as dedicated to keeping their business for a longer period of time, and as such it is riskier to dedicate resources to assisting them. All of the shop owners told us they would not give up their shop for another job opportunity. They seem to be dedicated to running their shops long term. This shows that these spaza shops are not survivalist, and their level of dedication indicates that business training and support systems would be worth the time investment because the shops will benefit for longer periods of time. During key informant interviews and focus group discussions, the shop owners identified the most pressing issues that they felt were holding back their shops. This gave the team an insight into which problems the spaza shop owners were the most interested in correcting. The most commonly identified issue was the infrastructure of the shop itself. Shop owners did not have enough physical space to stock more goods and would not have the ability to fix structural issues such as a leaky roof or the attractiveness of the shop. Competition was also identified as a major issue by several spaza shops. Shop owners also regretted not having more money to initially invest in their businesses, and not being able to attain a loan from the bank to start up their business. One shop owner thought that her shop was suffering because people would not pay for the goods they bought on credit, and one shop owner mentioned serious problems with crime. Overall the spaza shop owners identified problems that were preventing them from making greater profits. 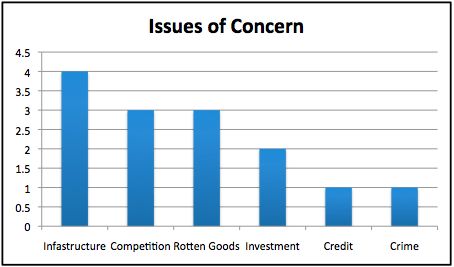 The table below highlights issues of concern identified by spaza shop owners. In addition to these findings, our team gained valuable information on the business practices of Monwabisi Park spaza shops. Seventeen shop owners attended the information session about the TTO’s programs on November 26th. Although we were unable to attend the meeting, Stanley, our sponsor, informed us that the overall tone was positive and enthusiastic. As a result of the meeting, 11 shop owners officially signed up for Shop-Net, and paid their R 10 membership fee. Their membership cards were delivered the follow week, and planned on ordering goods within the month. Additionally, 13 people signed up for business capacity building. The capacity building took place in the Indlovu Center the week following the information session. Due to lack of attendance on the first day, the training only took place for two days. On the second and third day, eight shop owners attended. Overall, people thought the training session was helpful, and they seemed excited to employ the skills they had just learned. Less than a week later we began to see the results of the training. For example, one shop owner had increased the range of goods in her shop, and made new signs to advertise her business. 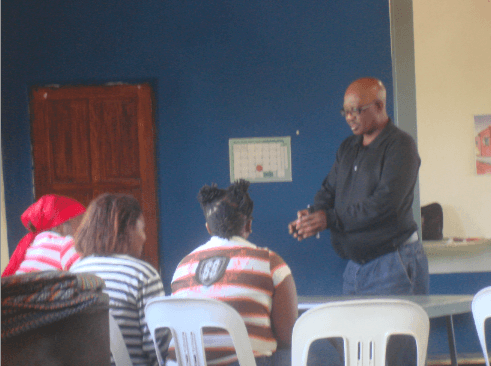 Overall, the businesses in Monwabisi Park were responsive to the business training. There were eight Monwabisi Park spaza shop owners and four members of the IBN present at the spaza association meeting along with our sponsor and advisors. Lulu, from the IBN, gave a testimonial as to why they formed their association, the steps they took to start up the association, their current operations, and the benefits they were already experiencing from working together. At the close of this impressive presentation the Monwabisi Park shop owners agreed that they would like to be part of a similar association, and they were hopeful to join in the IBN’s footsteps and would like to turn to them for guidance in order to develop this association. As a result the IBN and the Monwabisi Park owners set up a meeting for the following day in the Indlovu Center at 10:00 am. We were extremely surprised and excited by this rapid progression towards collaboration. The subsequent meeting took place in the Indlovu Center and was entirely run by the two founders of the IBN. Our team was not present at the meeting because it was a business meeting between the shop owners that we didn’t really have any role to play in, and the conversation was done entirely in Xhosa. The meeting ran for approximately two hours, and by the end of the meeting there were already tangible results of their collaboration. The groundwork for a Monwabisi Park spaza association was laid much faster than we anticipated, and there is now a point of contact for the shop owners. We are confident that the Monwabisi Park spaza association has the resources it needs to form successfully.